Join Mike Wazowski from Pixar’s 2001 film Monsters, Inc. for some laughs at this interactive comedy show. Attraction Open During EMH: Yes; evening. See our Extra Magic Hours page for more information. This attraction is located in the Magic Kingdom’s Tomorrowland. Several restaurants are located in close proximity to Monsters, Inc. Laugh Floor. In Tomorrowland, guests can indulge in specialty hot dogs and pretzels at The Lunching Pad or enjoy a more substantial counter service meal at Cosmic Ray’s Starlight Café and, seasonally, Tomorrowland Terrace. Cosmic Ray’s offers a diverse menu, including burgers, hot dogs, chicken, and ribs, while Tomorrowland Terrace serves burgers, hot dogs, chicken nuggets, and sandwiches. Ice cream is the specialty at Auntie Gravity’s Galactic Goodies. If you would rather eat a table service meal, Plaza Restaurant on Main Street USA offers a plethora of sandwiches and ice cream. Restroom: Facilities are located between Auntie Gravity’s Galactic Goodies and Mickey’s Star Traders. The purpose of Monsters, Inc. Laugh Floor is to generate power for the city of Monstropolis through laughter. In Monsters, Inc. Monstropolis was powered through screams, but Mike Wazowski discovered that laughter was a better energy source. Guests can submit jokes that may be used in the show via text message. Instructions are provided in the preshow video. Monsters, Inc. Laugh Floor features animated monsters interacting in real time with the audience. This technology was first utilized by Disney at Epcot with “Turtle Talk with Crush” and has also been incorporated overseas with “Stich Encounter” at Tokyo Disneyland Park and Hong Kong Disneyland Park, respectively, and “Stich Live!” at Walt Disney Studios Park Paris. 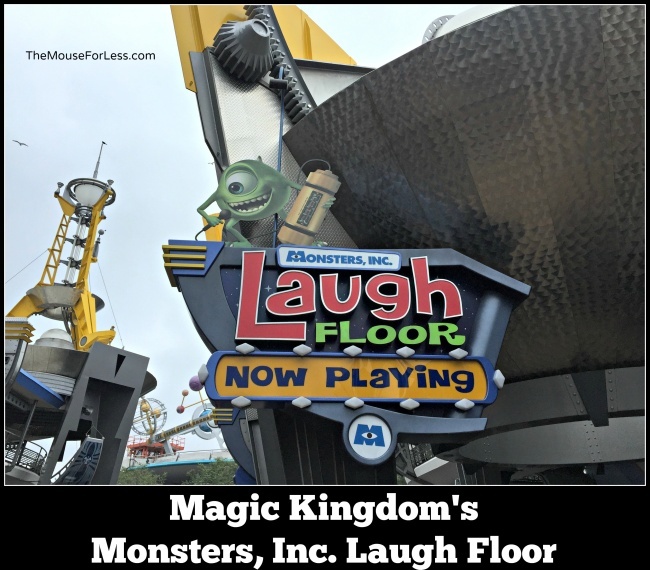 Mike and Roz are the only players from Monsters, Inc. featured in Laugh Floor. Numerous original monsters, such as “Buddy Boil” and “Marty Wazowski,” the latter Mike’s nephew, were developed for this attraction. Laugh Floor was updated in 2013 to reference Monsters, Inc.’s 2013 prequel, Monsters University. Pictures of random guests are transmitted on a video screen at the front of the theater prior to the show. These shots are accompanied by jokey captions. Random pictures of guests are also incorporated from time to time during the show proper. From 1994 to 2006, the space where Laugh Floor now sits was occupied by “The Timekeeper,” an elaborate Circle-Vision show featuring a journey from the distant past to the distant future. “The Timekeeper” was originally developed for Disneyland Paris, where it ran as “Le Visionarium” from 1992 to 2004. A Hidden Mickey can be found below a triangular roof in a window display inside the entrance to the attraction. Prepare to be involved in the show, as random guests are put on the theater’s screen throughout the performance. Submit a joke via text before the show. Monsters, Inc. Laugh Floor is not a good utilization of FastPass Plus due to the attraction’s high capacity and normally manageable wait times. If you have time, consider experiencing this attraction a second time because the monsters and jokes differ between shows. Consider watching Monsters, Inc. and Monsters University prior to your visit such as to better appreciate this attraction.